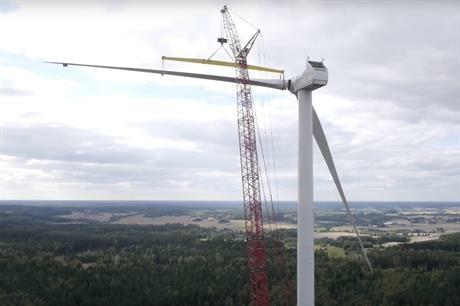 Only wind power developers competed in Finland's first clean energy tender, with operators of seven projects securing contracts for premium feed-in tariffs from the Finnish Energy Authority. Operators of the seven successful wind farms beat developers of 19 other wind farms to secure contracts. Premium tariffs awarded ranged between €1.27/MWh and €3.97/MWh, with an average top-up of €2.49/MWh. The Finnish Energy Authority had sought to procure 1.4TWh of electricity generation from wind power, solar PV, wave power, biomass and biomass, but all 26 auction entries were for wind projects. It ultimately awarded contracts to projects capable of generating a total of 1.36TWh. Successful developers, including CPC Germania’s Finnish subsidiary and Finnish company Fortum, will be awarded the tariff in addition to a €30/MWh market price for 12 years. Developers will receive the contracted amount in full when the average three-month market price of electricity is €30/MWh or below. If the market price exceeds the €30/MWh reference price, a portion of the tariff will be awarded on a sliding scale – ensuring they receive the reference price plus the tariff. No aid will be paid if the market price is higher than the sum of the reference price and the approved premium price. Projects are due online within three years of the approval decision, with the first three-month tariff period starting 1 January, 2022. Tuuliwatti, which will receive €2.94/MWh for its Tuuliwatti Simo Leipiö III wind farm.